The site StackOverflow.com is available for a few months, but I just recently discovered it. It is created by Joel Spolsky, Jeff Atwood, Jarrod Dixon, Geoff Dalgas, Jeremy Kratz, and Brent Ozar. The idea behind a site is a Question / Answer forum for all things development related. Not language specific at all. Definitely recommended place to visit. I’ve finally rebuilt my PC. The installation Vista install was relatively painless, except for one minor snag. When I booted from the DVD Drive, and deleted my old partition, Vista refused to install with a message: “Windows is unable to find a system volume that meets it's criteria for installation.” Ohh Sh*t… Well a quick search on Google (using a laptop), provided a solution. Removing USB from the boot-up sequence in BIOS settings resolved this problem. Before rebuilding the machine, I’ve spent a few hours backing up data from my desktop to DVDs. However, after reinstallation, I found out that I missed to backup my music collect. I don’t have that much, only 8 gigs or so, but it is still not something that I would want to miss. So here’s were Mozy comes in. I subscribe to Mozy’s online backup solution (http://www.mozy.com) For 4.95 a month, it provides a complete “Set it and Forget it” backup solution. After my machine was back up and running. I logged into the Mozy website. Selected “Restore using Web”, and chose my music folder. In about an hour, Mozy sent me an email notifying my that my restore files was ready. The email contained 3 links to file downloads: 3, 3, and 2GB files. About 1 hour for download, simple extract to the c:\ and I am back having my full music collection restored. 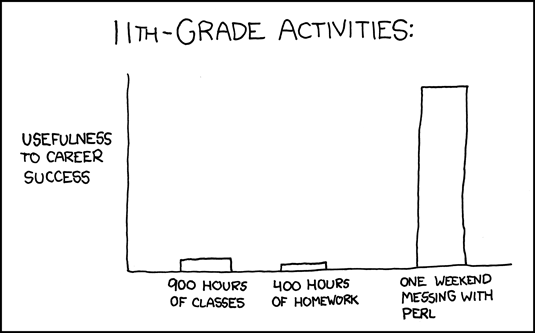 Sometimes, XKCD gets it just right. So, to all you students out there, theory is important, but you aren't a developer unless you actually WRITE CODE! At my workplace we are pretty big into using offshore consultants. As a matter of fact, half of my team is offshore. We use a Globant for an offshore resource provider (http://www.globant.com) In two words: Highly recommended. Our interaction with the Globant team is somewhat different then what I am used to with an offshore development team. They are considered full fledged members of a development team. There are always certain inefficiencies of working remote, some of them I can relate to (I work away from the main office most days of the week). However, there are always ways around them. It is sometimes hard to get in touch with a person in a moments notice. This usually requires planning, as well as an ability to put off your "onshore" things when you receive calls from a member of an offshore team. Time Management and flexibility is key. Regular scrum meetings are a must. It is very critical to have understanding between everyone on the team, on what all tasks are delivered, when, and by who. I found it extremely useful to have offshore developers come onsite for at the beginning of the engagement to establish communication. This allows all members of the team (offshore and onshore) to understand how the engagement will work. Offshore developers get a chance to see firsthand how their product effects the business, possibly meet the end users. Most importantly it opens up the communication channel where offshore developers are able to openly engage onsite team. Having an offshore project manager to help with the engagement helps. Offshore consulting is not something to be afraid of. Most people I know, work for companies that are split across multiple locations, sometimes across the street, but sometimes across the country or the world. Who knows, your business partner might be considering you "offshore"
Running it for 3rd time did not help much, so for now I am leaving it at that. Overall.... The machine definitely seems faster. Lesson: Defragment regulargly. I'll update the post in a few days to note if the performance stayed good. I am fairly new to Eclipse, but the more I use it, the more I like it. My latest discovery is how efficient it is to use of shortcuts to find "stuff" in Eclipse. The lookups are incredibly fast and are very useful. The typing part is critical. It is available even in preferences setup. I really wish this functionality would exist out of the box in Visual Studio.